7) Free Tract Explains Protestants to Eastern Europeans	5) Are Orgs & Churches Behind in Using Webcams? 5) and of course, for the English, North American world. 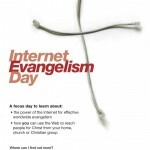 I’m glad to know about the Internet Evangelism and the formation of national digital evangelism networks. May God mightily use our current technology to bring more people into HIS Kingdom. Do you have any contact person who in-charge in Japan? Thanks!